Who speaks about us ? Keratoconus is a deformation of the cornea gradually weakened, it loses its spherical shape and takes a shape of an irregular cone. It is the weapon of choice for most patients with keratoconus. Adaptation, however, is difficult if not impossible in some cases. It is better to ask for a lens in the adaptation specialist (contactologist) and if possible lenses for keratoconus. The advantage of the contact lens relative to glasses is related to the interface that it creates with the tear film. The latter allows to glue a largely irregularities of the cornea. Hard lenses are much more effective but more complicated to fit. Sometimes in order to stabilize the lens on the cone, it is useful to overlay a rigid lens over a soft lens (Piggyback System). 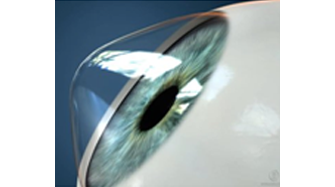 When the lens is not tolerated or more, it is licit to propose a surgical alternative. The intra-corneal rings are small rigid semi-circular segments of PMMA (plastic). Their place in the therapeutic management is between the failure of the lens adaptation and use of corneal transplantation. They posed for keratoconus since 1997. Introduced in the substance of the cornea, intra-corneal rings are designed to strengthen it. Well positioned, they can tighten the central cornea. The importance and irregular corneal astigmatism are thus reduced. This is a new treatment of keratoconus track. A photo resist (Riboflavin) is deposited on the cornea keratoconic then one session of UVA (ultraviolet long) is applied to the cornea for several minutes. The goal of treatment is to stiffen the collagen creating chemical bridges between collagen fibrils through the polymerizing action of phototherapy (principle of Cross Linking). The idea is to stabilize or to regress the disease. The first results are encouraging but preliminary. The principle of corneal transplant is simple. This is to exchange the central part of the diseased cornea from the same part of a healthy cornea from a deceased donor. The collection, storage and issuance of grafts are strictly codified. Corneal transplantation is a surgical procedure now well mastered. Keratoconus represent about 1/3 of indications of corneal transplants. Only patients whose visual acuity is insufficient with contact lenses or not being able to benefit from improved with intra-corneal rings are on the waiting list for a corneal graft.